Dales horses come from the Pennines in northern England. They received their name by the famous Yorkshire Dales. Dales horses are related to Pennine Pony that were cross bred with Friesian horses. Scots later cross breed them with Scottish Galloway horses. The resulting horses had increased speed and were better all around athletes. 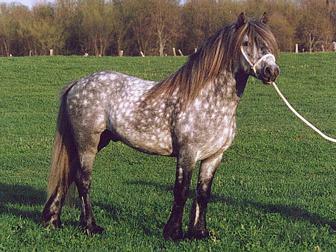 They continued on to be bred with many other horses, such as the Clydesdale, Yorkshire, Norfolk Terrier, and Welsh Cob stallions. Dales horses are used for riding purposes for children to adults and for harness work as well. They were involved in trotter races around the globe and can currently be found mostly in Europe. They are bred in the United Kingdom, Ireland, Scotland, and Wales. They are considered surefooted and very powerful. Dales are beautiful creatures, gentle, yet strong. Dales horses were created to be a pack horse and are useful for carrying heavy loads. Currently, they are used by children for riding lessons and have a distinct attractiveness. The Dales horses are a smaller style (14 hands high). They are found blacks, brown, gray, roan, and bay colors. Their heads are described as neat and not boding any dishing effects. They have a sloping shoulders and hard feet as well. They are well known for having a shiny coat and a long and flowing tail. With quarters that are long and strong, they can be used for any type of pulling exercise with very little effort. Dales horses are easy to maintain. They can survive in any climate range, and even thrive in colder areas.